This individual Report The Online Debit Opportunity for PIN-Based and 'PIN-Less' Debit is available for purchase. This Report is available to members of Mercator Advisory Group’s Debit Advisory Service. Please be advised that this Report is normally part of a research and advisory service that provides ongoing support throughout the year. As such, this Report contains significant depth of content that is selected for its strategic importance to our members. (For a description of these services, see our Advisory Services section). This report identifies market opportunities to expand usage of PIN-based debit cards in the online environment. Today's lack of a widely accepted solution for using PINs online has limited the use of EFT debit in this rapidly expanding market. The most immediate growth opportunities are in the payment of recurring household bills, where a "PIN-less" version of EFT debit has taken hold, primarily in the expedited/late pay segment. Longer-term opportunities in the fast-growing e-commerce segment must await the deployment of a proven online PIN technology. Growth in consumers' use of both signature and PIN debit at the point-of-sale has grown rapidly, and consumers often favor the use of PIN over signature debit for its perceived security and ease of use. The report tracks debit's growth and key consumer attitudes driving its growth. In the world of e-commerce, debit usage, essentially restricted to signature debit usage, has also grown impressively. While the e-commerce segment its modest in sales volume today when compared with the total consumer spending market, its rapid growth makes it strategically important as a source of future payment volume. 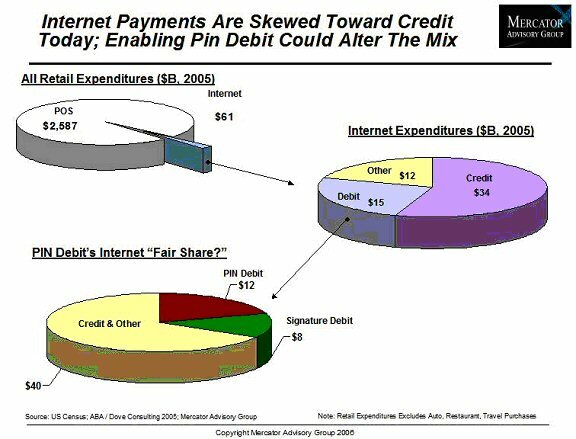 Mercator's analysis suggest that in 2005 dollars, PIN debit's "fair share" of the e-commerce segment would be $12 billion in sales volume, if a suitable authentication solution were available to ATM cardholders (see exhibit below). A number of potential online PIN technologies are received as potential solutions. This report also evaluates opportunities for EFT debit in the recurring payments segment. Estimated to be $1.4 trillion in annual payment volume, the bill payment segment has given PIN debit a foothold using a "PIN-less" solution enabled by EFT network rules. The inherently low fraud associated with payments to utilities, educational institutions, financial institutions and other selected categories ensures that transactions authorized by billers and ATM card issuers result in very low fraud rates, even though they are not PIN-secured. These transactions are supported in both online and telephone/VRU environments. Most of these PIN-less payments are for expedited/late pay consumer bills, and miss the huge volume opportunity of pre-authorized recurring payments. The report estimates the potential market opportunity that could be addressed if PIN debit were allowed as a competitive payment option for recurring bills. "PIN-less debit, while it is a limited solution and restricted to the bill payment segment, still has significant growth opportunities. Moving beyond expedited payments to recurring payments more broadly opens up significant volume potential. EFT network rules for recurring payments using PIN-less debit, which are currently under development, could open this market opportunity. Beyond consumer bills, selected online retailers, with modest average ticket sizes and robust customer authentication data, might also be considered low fraud risk merchants that could fit within expanded PIN-less debit rules. While we wait for a proven online PIN solution, PIN-less debit still has room to grow." The report is 31 pages and contains 18 exhibits.